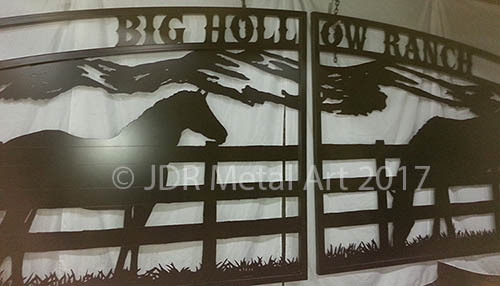 ranch driveway gates Archives - Custom Driveway Gates - Iron Steel & Aluminum - JDR Metal Art - FREE Standard Shipping! 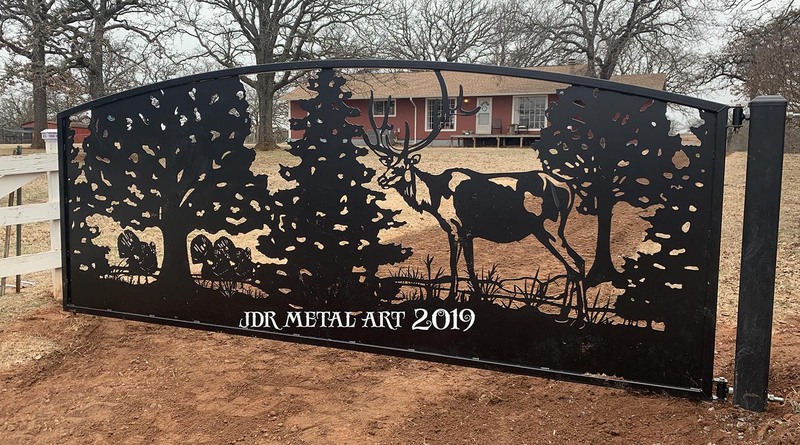 These Oklahoma driveway gates were custom designed and handcrafted by JDR Metal Art for an elk ranch near Oklahoma City. We built three 15′ single swing gates with an elk and turkey gate theme that goes great with the client’s ranch property. We began with the customer’s design concept. After several drafts we finalized a design that the customer was comfortable proceeding with. Once the design was complete we began cutting material. Here’s a clip of the square tubing frame being mitered on a horizontal band saw. Miter cut parts are significantly stronger when welded and transfer force more efficiently than overlapped & welded parts. 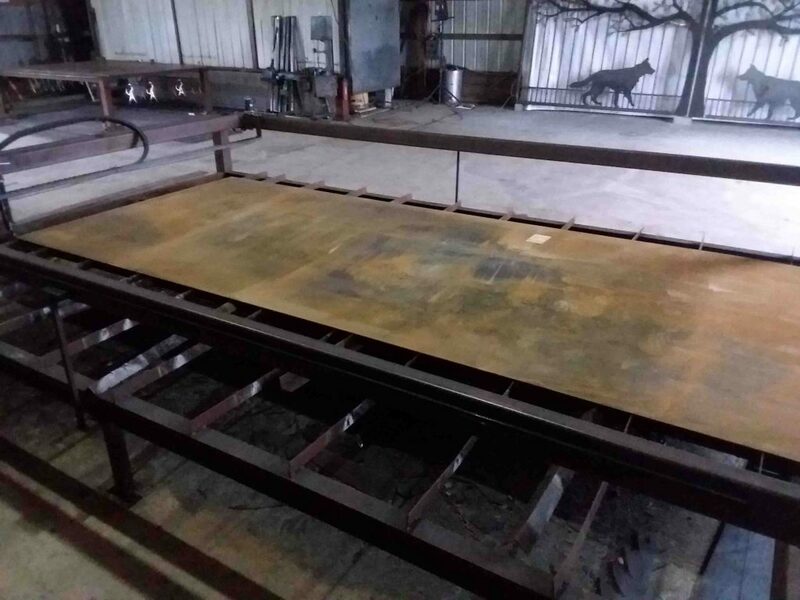 In the picture below the 15′ sheet is loaded on the table, indexed and ready to plasma cut. Below we’re cutting the turkeys. 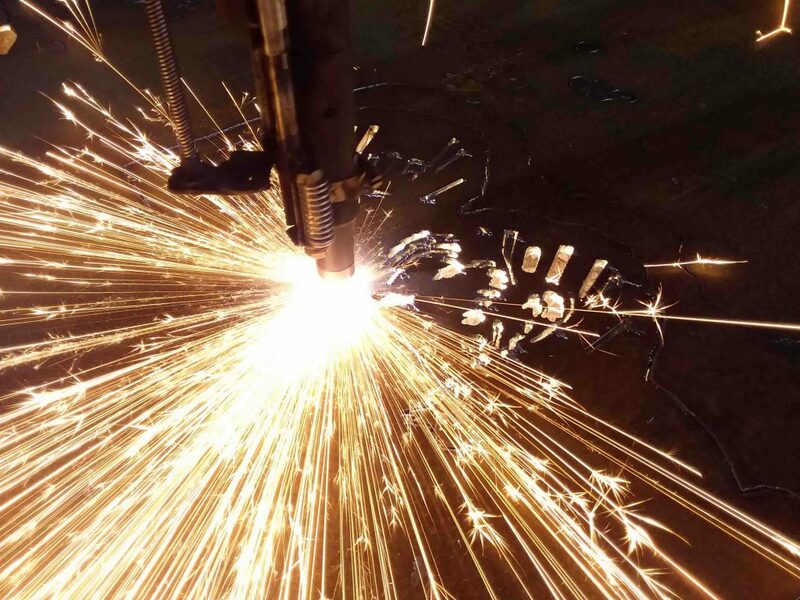 These silhouettes are cut from 15′ long, 3/16″ thick steel sheets. 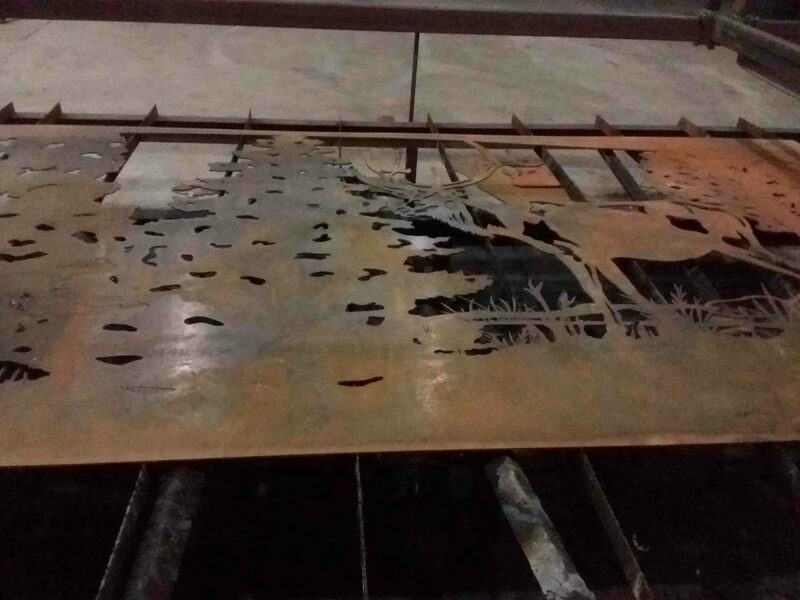 Here’s one of the 15′ sheets once plasma cutting has been completed. Using a forklift to move the sheet to the welding table to be welded into a gate frame. It takes some creativity to make it happen with parts this size. 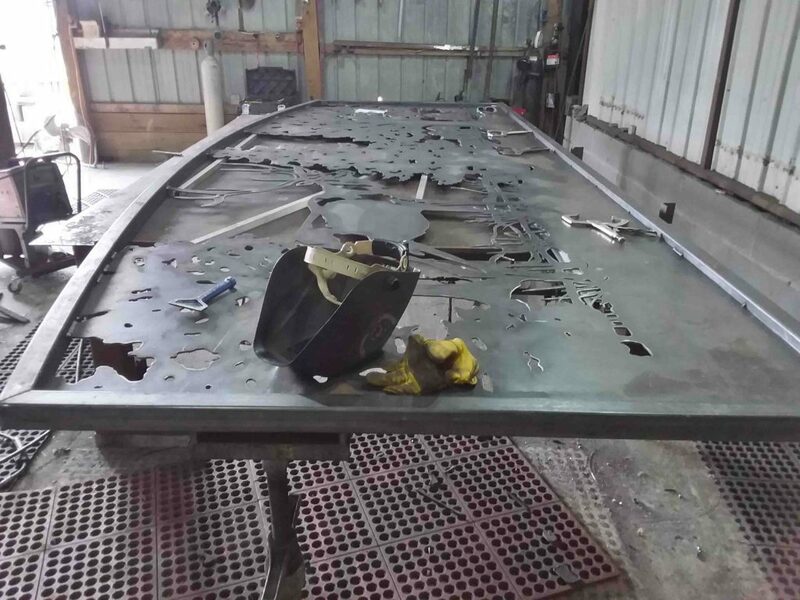 This gate panel is welded into the frame and ready for sandblast & powder coat. This is the main entrance to the ranch. The client installed the gates after delivery. Two other gate panels are installed elsewhere on the ranch. 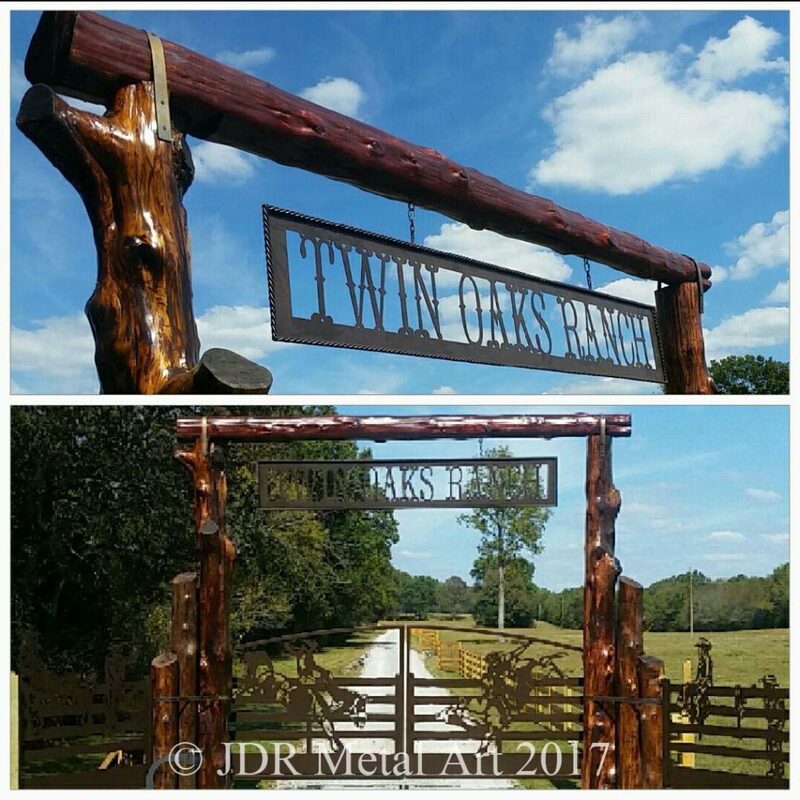 Gate is hung from 6×6″ square tubing post and hinges are adjustable roller bearing hinges custom made by JDR Metal Art. This was really a fun project to do…the customer was fantastic to work with every step of the way. If you need a custom Oklahoma farm or ranch driveway gate be sure to get in touch with us! We make them any size, and design and deliver nationwide. We look forward to making your gate project a big success! 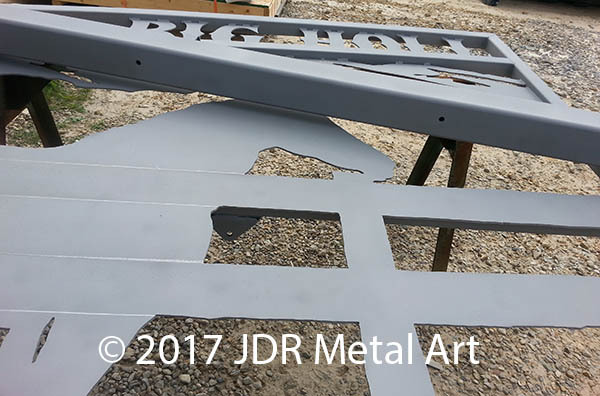 We designed, built, powder coated and shipped these custom ranch gates to our client in Colorado. Our customer installed the Apollo gate openers himself. To make his job much easier we also mounted the gate opener brackets for his gate openers so that everything is ready for him to bolt together onsite. We sandblast our gates clean for ultimate adhesion and bonding of the powder coat to the metal surface. 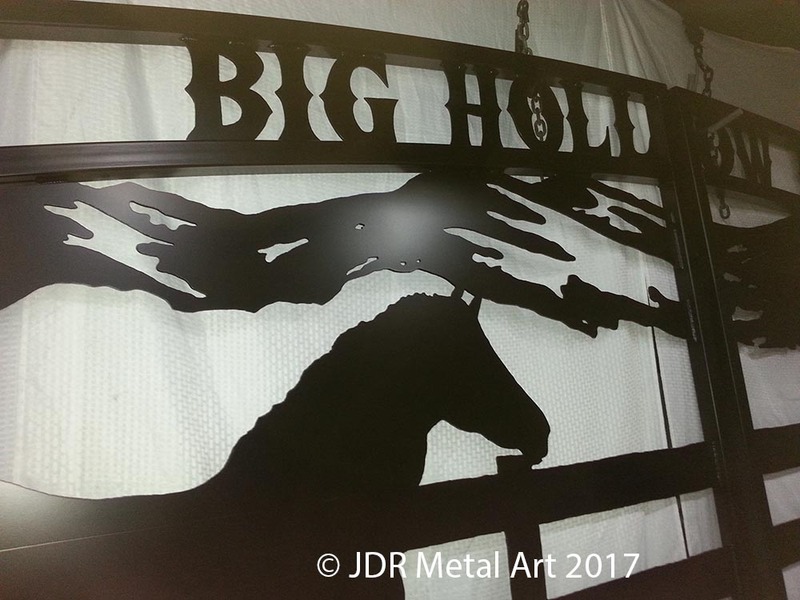 These custom plasma cut ranch gates are definitely one of the coolest projects we’ve had the opportunity to be involved with..not to mention how great the customers were to work with! 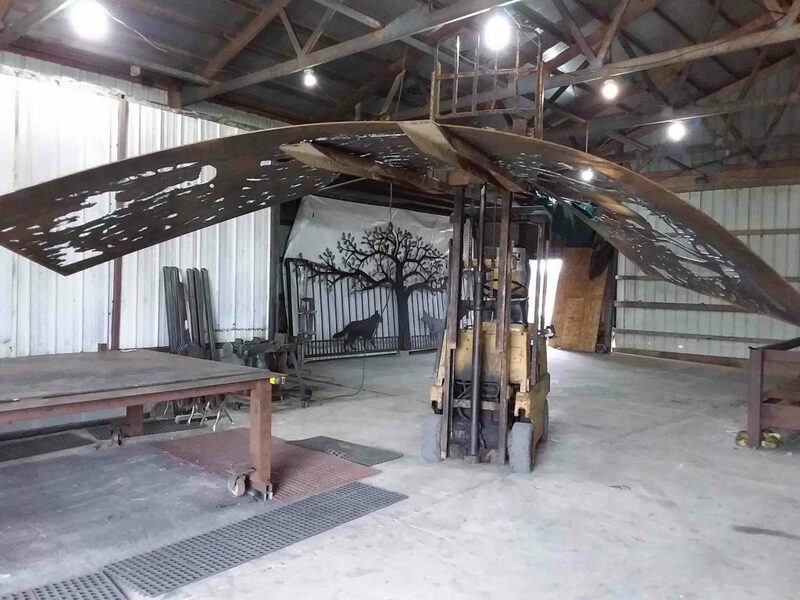 We handcrafted each element of this driveway gate project from raw steel material using a band saw, plasma cutter and mig welder. These dual swing driveway gates are each complemented by a side panel. There is also an overhead sign which is wrapped with twisted steel rope. We sandblasted and powder coated each part with a customer-selected color for the ultimate long-lasting finish. Every gate project we take on is as important to us as it is to our clients. That’s why we handle every stage of the project from start to completion! It allows us to ensure that our customers are always receiving the highest quality driveway gates and accessories possible. From the initial consultation to the design stage on through until the finished product is shipped out or delivered and installed…we do it all! Need a free consultation for your upcoming custom driveway gate project? Give us a holler!